Universal patterns or trends are rare in demographic research. Yet we have uncovered one: since 1980, all 50 U.S. states have become more ethnically and racially diverse (Lee et al. 2017). Such a finding may not seem surprising given that it mirrors the direction headed by the nation as a whole. Immigration, youthful age structures, and higher fertility have contributed to minority population growth, especially among Hispanics and Asians (Lichter 2013). Diversity has also been boosted by intermarriage (which produces multiracial offspring) and changes in racial self-identification. The operation of these mechanisms, coupled with a shrinking share of whites, is turning America into a rainbow-hued society. Without exception, states have followed suit. Our interest in states reflects their role as governmental entities for which ethnoracial diversity can have important implications. For example, diversity has already altered the electoral map, increasing the number of states in which Democrat-leaning minority groups constitute influential constituencies (Frey 2015). Some studies document significant effects of the representation of immigrants and people of color on a state’s educational and health policies, welfare programs, and economic performance (Fox et al. 2013; Hero and Tolbert 1996; Peri 2012). At the same time, state-initiated legislation (e.g., targeting unauthorized immigrants) may shape migration streams in a diversity-suppressing fashion (Leerkes et al. 2013; Pena 2009). Simply put, racial-ethnic diversity matters to states as both an outcome and antecedent of social, economic, and political circumstances. Our claim that it is universally rising therefore deserves scrutiny. The magnitude or level of diversity depends upon the number of ethnoracial groups in a population and their relative sizes. Think of a state’s population as a pie, with each slice depicting a different group. Intuitively, the greater the number of equal-sized slices, the more diverse the state would be. We calculate our measure of diversity magnitude—the standardized entropy index, or E—across five panethnic groups: Hispanics of any race, non-Hispanic whites, blacks, Asians (including Pacific Islanders), and ‘others’ (a small residual category that combines Native Americans, multirace individuals, and people identifying with some other race). A hypothetical state where all five groups make up equal slices of the population pie would receive the maximum entropy score of 100. At the opposite extreme, the E value for a single-slice state would be 0, signaling minimum diversity (or maximum homogeneity): all residents belong to the same group. 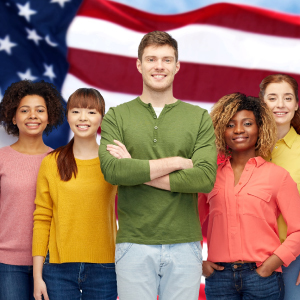 We use 1980, 1990, 2000, and 2010 U.S. census data and 2015 American Community Survey data to examine state diversity levels over a 35-year period. For simplicity’s sake, Figure 1 only reports 1980 and 2015 E scores, but it still conveys several key insights. 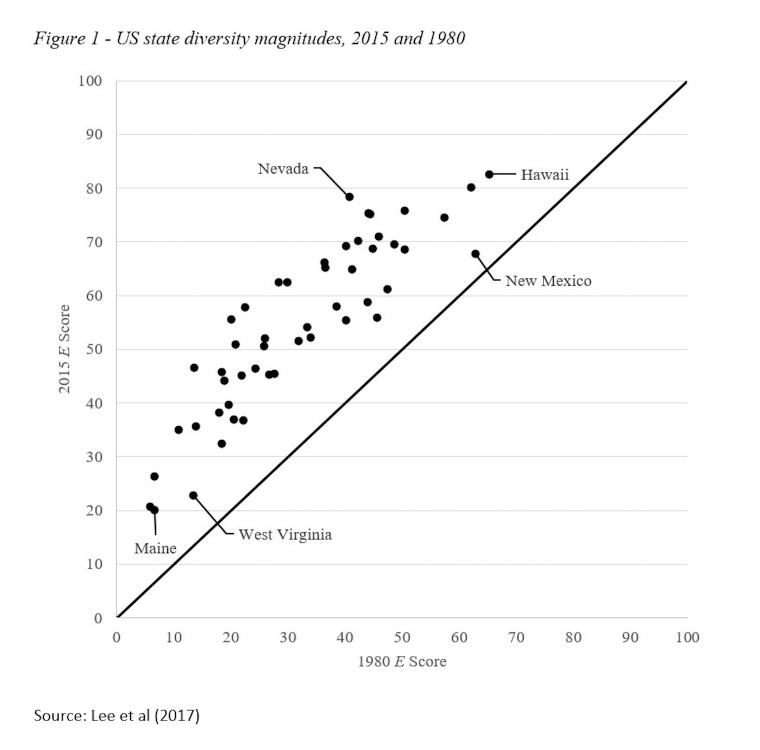 First, states differ markedly in diversity magnitude at both time points, spanning a 60-65 point range whether viewed horizontally (the dispersion of 1980 E scores) or vertically (the dispersion of 2015 scores). As an illustration, the highest 2015 E—Hawaii’s 83—is over four times greater than the lowest, Maine’s 20. Second, the fact that all states are located above the diagonal supports the universality of increasing ethnoracial diversity. But the third insight, captured by vertical distance from the diagonal, is about the degree of variation in these increases. Nevada has become one of the most diverse states in the country based on its 37-point gain in E. By contrast, New Mexico and West Virginia are the only states to experience single-digit increases since 1980. What distinguishes ‘big-gainer’ states like Nevada from their ‘small-gainer’ counterparts are the former’s expanding foreign-born populations, which on average grew 358% during the study period. Despite the range of diversity increases that have occurred, a rather stable diversity hierarchy can be discerned. This hierarchy—where states stand in relation to each other—is much the same now as in the past, as attested by a Spearman rank-order correlation of .90 between states’ 1980 and 2015 ranks on the entropy index. 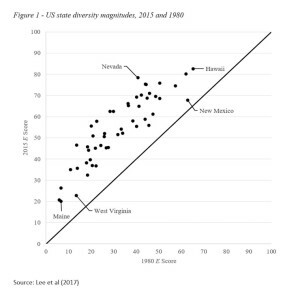 Line graphs that plot the diversity magnitudes of each state across all five time points are roughly parallel in nature, further confirming the existence of relative stability amid change. Stability also appears when diversity is mapped. Although levels of diversity have shifted upward, the location of higher-diversity states continues to form a rough U shape running from the Pacific region through the Southwest and up the Atlantic seaboard. Fully understanding ethnoracial diversity requires awareness not only of its magnitude but of its structure, i.e., the specific panethnic groups that represent non-trivial shares of a state’s population. To capture this structural dimension, we have developed a simple typology in which states are classified according to their largest group and any other group(s) containing at least 10% of all residents. Table 1 provides a 2015 snapshot of the mean characteristics of the six resulting structural types. Approximately four-fifths of states fall in the first three types: white, white/black, and white/Hispanic. The last three types exhibit less common but more complex diversity structures. White/other states (Alaska, Oklahoma, and South Dakota) are distinguished by their disproportionate numbers of Native Americans. Five traditional immigrant gateways (New York, Texas, New Jersey, Florida, and Illinois) qualify as white/Hispanic/black. The final, minority plurality type consists of three states where a minority group is numerically superior to whites: Hispanics in both California and New Mexico and Asians in Hawaii. The frequency distribution of states by structural type (last column of the table) looks very different now than it did 35 years ago. A majority of all states (26) were largely white in 1980, but only a dozen of that type remained by 2015. At the same time, big increases are evident in the white/Hispanic and white/Hispanic/black types (from 4 to 12 and from 1 to 5, respectively), and white/other and minority plurality states now collectively total 6 rather than 2. Together, these shifts suggest that a broader transition from single-group to multi-group structures is underway in which the rapidly growing Hispanic and Asian populations figure prominently. On further review, the trend toward greater ethnoracial diversity is universal in at least a narrow sense: diversity magnitude has increased in all 50 states between 1980 and 2015. We acknowledge that the trajectories followed are not identical, with states beginning and ending the period at a range of levels and manifesting different types of racial-ethnic structures. Yet we believe that diversity will continue to rise nationally, thanks to the momentum provided by cohort succession. Because younger, more racially mixed cohorts are primed to replace older, whiter ones, the upward trend in diversity should be self-sustaining even in the face of sharp reductions in immigration (Lichter 2013). Whether every state will still participate in the trend is less certain. Our research has documented exceptions at other geographic scales, identifying handfuls of metropolitan areas, counties, and communities already experiencing diversity declines (see, e.g., Lee and Hughes 2015). Keep in mind that a high level of diversity reflects a delicate balance among group sizes and growth rates, which rarely stay the same for extended periods. If one or two groups starts to outdistance the others over time, an inflection point is passed when the racial-ethnic slices of the population pie become less equal again, pushing diversity downward. Economic conditions, public policies, and social networks are among the factors that could attract some groups to a particular state while repelling others. California and New Mexico, both of which have registered minimal gains on the entropy index since 2000, strike us as likely candidates to buck the upward trend in state diversity in the near future. Fox, Cybelle, Irene Bloemraad, and Christel Kesler. 2013. “Immigration and Redistributive Social Policy.” Pp. 381-420 in David Card and Steven Raphael (eds. ), Immigration, Poverty, and Socioeconomic Inequality. New York: Russell Sage Foundation. Frey, William H. 2015. Diversity Explosion: How New Racial Demographics Are Remaking America. Washington, DC: Brookings Institution Press. Hero, Rodney E. and Caroline J. Tolbert. 1996. “A Racial/Ethnic Diversity Interpretation of Politics and Policy in the U.S.” American Journal of Political Science 40(3):851-871. Lee, Barrett A. and Lauren Hughes. 2015. “Bucking the Trend: Is Ethnoracial Diversity Declining in American Communities?” Population Research and Policy Review 34(1):113-139. Lee, Barrett A., Michael J.R. Martin, Stephen A. Matthews, and Chad R. Farrell. 2017. “State-Level Changes in U.S. Racial and Ethnic Diversity, 1980 to 2015: A Universal Trend?” Demographic Research 37(article 33):1031-1048. Leerkes, Arjen, James D. Bachmeier, and Mark A. Leach. 2013. “When the Border is ‘Everywhere’: State-Level Variation in Migration Control and Changing Settlement Patterns of the Unauthorized Immigrant Population in the United States.” International Migration Review 47(4):910-943. Lichter, Daniel T. 2013. “Integration or Fragmentation? Racial Diversity and the American Future.” Demography 50(2):359-391. Pena, Anita Alves. 2009. “Locational Choices of the Legal and Illegal: The Case of Mexican Agricultural Workers in the U.S.” International Migration Review 43(4):850-880. Peri, Giovanni. 2012. “The Effect of Immigration on Productivity: Evidence from U.S. States.” Review of Economics and Statistics 94(1):348-358.